It is with great sadness that the Ministry of Defence must confirm the death of Corporal Darryl Gardiner, Royal Electrical and Mechanical Engineers (REME), in southern Afghanistan on Sunday 20th January 2008. He was serving attached to 5th Regiment Royal Artillery and 52 Brigade's Reconnaissance Force. Corporal Gardiner was taking part in an operation to disrupt enemy forces and reassure local Afghans three kilometres north of Musa Qala district centre in Helmand Province. Shortly after 1530 hours local time the vehicle he was travelling in was hit by a roadside mine strike. Corporal Gardiner was evacuated by helicopter to the field hospital at Camp Bastion for medical treatment but sadly he did not survive. Five other soldiers were injured in the explosion and they are now receiving medical care. There were no enemy forces involved. Corporal Darryl Gardiner, aged 25, was born in Germany on 25 January 1982. He was from Salisbury in Wiltshire and was known to his friends as ‘Daz’. He deployed to Afghanistan on 19 October 2007 with 52 Brigade. He was attached to 5th Regiment Royal Artillery, which works with the 2nd Battalion The Yorkshire Regiment as part of the Brigade Reconnaissance Force; providing information for Task Force Helmand, based in Lashkar Gar. As an armourer, Corporal Gardiner provided essential support to the Brigade Reconnaissance Force both on and off patrol. The family are deeply proud that Darryl served his country. The family asks at what is a very difficult time for them, that their privacy is respected. Corporal ‘Daz’ Gardiner was an exceptional young man and a man that the Brigade Recce Force will miss so much. His death has been a bitter blow to us all. We in the Brigade Reconnaissance Force have lost a good friend, a courageous soldier and a remarkably skilled tradesman but we are only too aware that his family has lost so much more, it is they who are at the forefront of our minds. Corporal Gardiner occupied a position at the very hub of the Brigade Reconnaissance Force. As the armourer he was key to maintaining our battle-worthiness. Prior to deploying on each operation the force would undertake a weapons check on the ranges and there would always be the odd problem for Corporal Gardiner to deal with. He would hurry up and down the line of vehicles with his toolbox, or as he joked his ‘collection of different sized hammers’, fixing and tweaking the problem weapons. He faced a real professional challenge, due to the nature of our deployments his “workshop” was the desert floor, yet he persevered and, despite the battering the weapons took, he would work miracles to keep things up and running. Corporal Gardiner had proved himself under fire on a number of occasions during this tour, he epitomised the cool, calm and courageous modern soldier. He even enjoyed momentary fame when he was part of a small team that defeated a vehicle-borne suicide bomber in Gereshk in October 2007. Corporal Gardiner was a very accomplished parachutist. Just prior to deploying to Afghanistan he ran a parachuting expedition in California. He discussed the possibility of running another expedition in summer 2008 for personnel from 4/73 Battery. I agreed to this, in principle, only to discover that he had virtually organised and planned the whole thing already. How could I fault such enthusiasm? Corporal Gardiner drove the Battery Sergeant Major’s vehicle and this brought additional responsibilities. Some were less glamorous than others; for example running the ‘tuck shop’. He was reliant upon the Brigade Reconnaissance Force team in Camp Bastion for his stock and I recall his dismay when they despatched ‘Yorkie Bars’ for him to sell. Yorkie bars, of course, are freely available in the ration packs. Only ‘Daz’ could get away with selling a bar on the basis that ‘these ones taste different to the issue bars’! Corporal Gardiner had spent 3 months living and operating in the harshest of environments, yet despite such constant adversity he always soldiered on in the most pleasant and good natured manner. Corporal Gardiner was good to be around, he was a gentleman, we will all cherish the time we had with him. It is with enormous sadness that we have lost Corporal ‘Daz’ Gardiner. Professionally we have lost a bright and talented soldier who was first class at his job, a man who prided himself on getting things done and who took great pleasure in his work. On a personal level we have lost far more. He showed a rare sensitivity and compassion for others and his warmth of character has been of comfort to many. He has demonstrated an enduring courage and loyalty to his friends and colleagues. Underpinning his quality was desire not to let others down; he never did. It is testament to his character that his last actions were helping others. He will be sorely missed and our thoughts and prayers are especially with his family and girlfriend, Lucy. 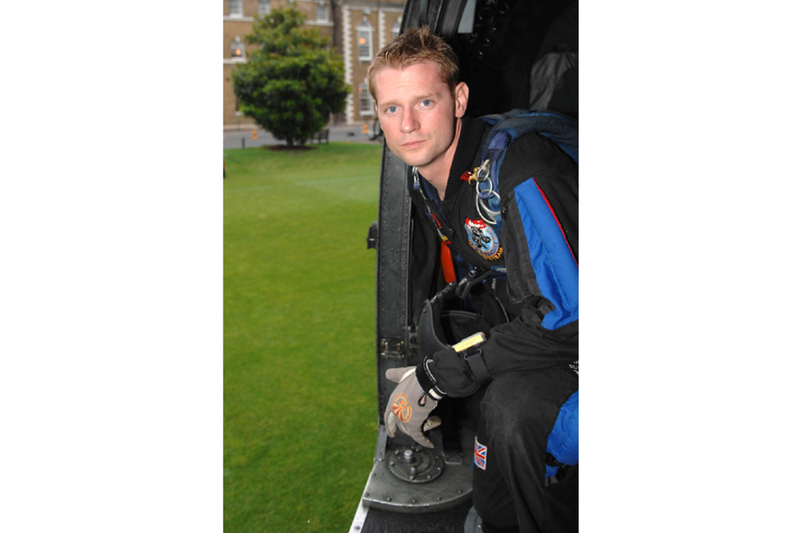 ‘Daz’ Gardiner started parachuting with the REME Parachute Team in 2001. He was a most enthusiastic and capable student parachutist who in a very short space of time developed into an outstanding parachute instructor. His love of the sport knew no bounds. He made a huge contribution to the Army Parachute Association and his Corps as a tandem instructor, accelerated free fall instructor, static line instructor and display parachutist. He was looking forward to his return to UK where he was to instruct on an adventurous training expedition, taking soldiers off to California to teach them to skydive. With his helpful and friendly nature he was always able to put his students at ease and encourage them to make their first jump. He represented his Corps and the Army in parachute competition and was one of the leading competitors in the Armed Forces. ‘Daz’ was a very popular and likeable soldier. He leaves behind many military and civilian friends in the world of skydiving who will miss him dearly. The death of such a capable soldier as Corporal Gardiner is very sad. It is clear that he will be deeply missed, not only as a courageous and exemplary professional but also as a kind friend. My thoughts and prayers are with his family and friends in their time of loss.